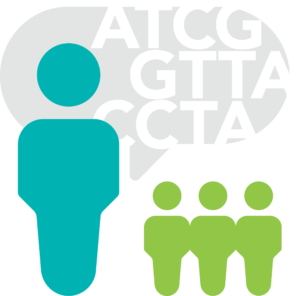 On the fourth Tuesday of each month, members of the DNA Interest Group gather at the Iowa Public Library to discuss personalized genetics testing. 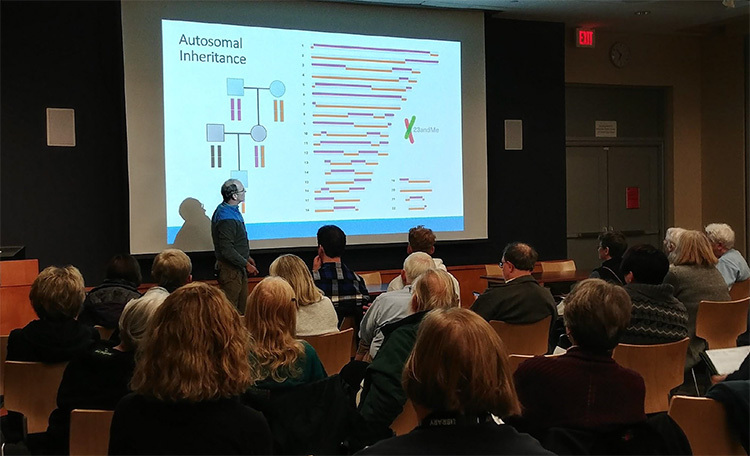 Started by Dr. Bryant McAllister, a professor of genetics and evolution at the University of Iowa, the DNA Interest Group meets to help educate members of the Iowa City community about personalized DNA testing. Members of the interest group come from a wide range of ages and backgrounds, intermixing university students, and people from the general community. Since its creation early last year, the DNA Interest Group works to connect people interested in learning more about direct-to-consumer DNA tests, such as those offered by 23andMe, ancestry.com, and other companies. During the meetings, a wide range of topics are discussed. Conversations have dealt with debunking the common myths about genetics, ways to use personalized DNA testing as a teaching tool in the classroom, as well as security concerns arising from using genetic testing services. The group also sponsors a “Festival of Genetics” on National DNA Day. National DNA Day, held on April 25th every year, celebrates the completion of the Human Genome Project in 2003 along with Watson, Crick, Wilkins, and Franklin’s discovery of the DNA double helix in 1953. During the festival, members of the University of Iowa’s Personal Genome Learning Center set up different stations to teach community members about genetics, and they also offer support to anyone with questions about their DNA test results. Dr. Bryant McAllister, above, explains genetic concepts to Iowa City community members during a DNA Interest Group meeting, at a local public library. Photo courtesy of Hannah Ericson. 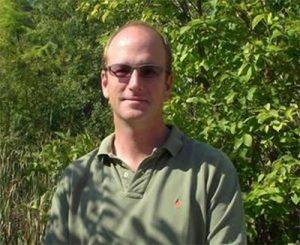 Professor Bryant McAllister is the founder of the DNA Interest Group and a professor of biology at the University of Iowa. Photo courtesy of Bryant McAllister. During an interview for an episode of the Talk of Iowa radio program, Dr. McAllister got his first stroke of inspiration to start the DNA Interest Group. While on the air, a community member called into the program to ask for help on how to understand his DNA test results. This experience opened Dr. McAllister’s eyes to the need for resources for community members to help them interpret their genetic test results, and deepen their understanding of genetics. In the future, Dr. McAllister says, “I would like to expand outside of Iowa City. For students thinking of starting a DNA Interest Group of their own, Dr. McAllister has some advice. He recommends, “I would try to get some kind of faculty buy-in. A faculty member would be essentially a sponsor that helps with some of the organization and making contacts,”as many students may not have the support network needed to start a project of this size. After that, he said it’s mostly about trying to connect to other community members or resources, in an effort to reach more people and to grow the group. 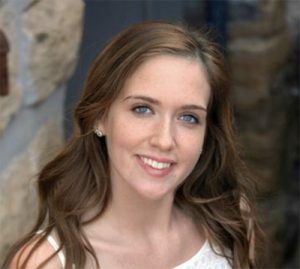 Abagail McKernan, a sophomore at the University of Iowa, is an active member of the DNA Interest Group. Photo courtesy of Abagail McKernan. Abagail McKernan is a sophomore studying genetics and biotechnology at the University of Iowa and is a member of the DNA Interest Group. She first joined the DNA Interest Group through her involvement with another group at the University of Iowa, the Personal Genome Learning Center. Abagail especially enjoys being able to interact with members of the community, with whom she normally would not have a chance to communicate with. “You wouldn’t think people, especially people from older generation, would be as interested in it [personalized genomics] as you are seeing at these meetings,” she says. Abagail likes that everyone who comes to the meetings shares common interests, and she enjoys educating community members on genetics topics that they may not be completely familiar with. For example, on DNA day, Abagail held demonstrations on the processes of mitosis and meiosis (different ways that cells undergo division) using gummy worms—which participants were able to eat afterwards. Abagail plans on continuing her involvement with the group in the future as she thinks that communicating with the public about science topics is important. For students thinking about starting a similar group, Abagail recommends advertising the group in as many places throughout the community as possible. This would include putting up posters throughout the community. As a result, this group would help educate many community members, which helps foster a greater understanding of scientific topics in the community and beyond.